ST. PAUL, Minn. -- The Minnesota Wild are not ready to start their summer vacation. Yet, the Wild know if they don't find a way to win their next two games, the ugly specter of almost four months without meaningful hockey will become a reality. 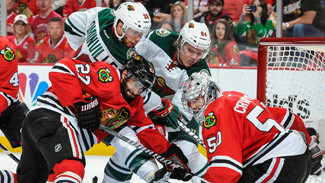 For additional insight into the Stanley Cup Playoff series between the Minnesota Wild and Chicago Blackhawks, NHL.com has enlisted the help of former NHL coach Craig Ramsay to break down the action. Ramsay will be checking in throughout the series. Ramsay played in more than 1,000 NHL games with the Buffalo Sabres before going on to coach the Sabres, Philadelphia Flyers and Atlanta Thrashers. In the 2000 Stanley Cup Playoffs, he led the Flyers to the seventh game of the Eastern Conference Final. Ramsay was most recently an assistant coach with the Florida Panthers. The Minnesota Wild are perfect at Xcel Energy Center in the 2014 Stanley Cup Playoffs with five wins in five games. If they want to stay that way and extend their season by at least one more game, longtime NHL coach and player Craig Ramsay said the Wild need to make two relatively minor adjustments against the Chicago Blackhawks in Game 6 of their Western Conference Second Round series Tuesday (9 p.m. ET; CNBC, TSN, RDS2). "They have to make it difficult on the goalie by getting someone in front of him," Ramsay told NHL.com, "and they have to be aware of those stretch passes." Ramsay said the Wild should be able to make each adjustment work in conjunction. The key is using the high ice in the offensive zone. By using the high ice, the Wild will have three guys higher in the zone, creating up top to generate scoring chances off shots and deflections. The other two forwards have to get to the front of the net, but having three players high preserves Minnesota's defensive integrity, particularly against a stretch pass, should it lose possession of the puck. "If there is a turnover, they will have people in good position to backcheck because your high forward is ready to come back and your defensemen are in position," Ramsay said. "By using the high ice, they should have guys in good position both offensively to shoot and defensively to backcheck through the middle to take away the stretch pass off the wall or into the middle of the ice." The Blackhawks love the stretch pass. They try to use it whenever it's available, and they burned the Wild with a mini-version of it in Game 5 because of Peter Regin's speed. Regin received Brent Seabrook's pass out of the defensive zone, dished it to the left-wing wall, got it back and burst down the middle of the attacking zone with speed. Wild defenseman Jonas Brodin had to hook him to slow him down, and he didn't get away with it. The Blackhawks capitalized on the ensuing power play when Bryan Bickell parked himself in front of Wild goalie Ilya Bryzgalov and beat him on a deflection of Patrick Kane's wrist shot. Ramsay, though, said the Wild would have been in better position to defend Regin instead of hook him had defenseman Ryan Suter closed the gap in the middle of the ice after Regin moved the puck to defenseman Duncan Keith on the left-wing wall. He said closing the gap is one key to defending the Blackhawks' transition speed, especially when they use the stretch pass. "Regin went right through the D because they were too wide," Ramsay said. "When it goes up one side, that other defenseman on the other side has to immediately get back into the middle of the ice. Regin went through, the Wild end up taking a penalty, and the Hawks score on the power play. That's going to be a very important issue. If they're going to stretch the puck, and Chicago is going to try to explode a guy through the middle, either a forward has to be really good defensively coming back or the defense have to react into the middle of the ice. Either way they do it they have to take away the middle of the ice." Ramsay said he noticed the Wild trying to use the high ice to make plays and create scoring chances in the third period Sunday, but they didn't have anybody at the net, so Blackhawks goalie Corey Crawford didn't face the same type of challenge Bryzgalov faced on Bickell's game-tying goal. Crawford finished with 27 saves in Game 5. "Crawford was really solid," Ramsay said. "He's not floundering around. He's not diving and making spectacular saves. He really just looks awfully good, like he knows what he's doing. He's really in control of himself. I'm sure that's a bit frustrating for the Wild." It's up to the Wild to make Crawford frustrated in Game 6 and take away the Blackhawks' favorite option, the stretch pass. "I think at home they do a better job of it," Ramsay said. The task starts Tuesday with Game 6 against the Chicago Blackhawks at Xcel Energy Center in this entertaining Western Conference Second Round series (9 p.m. ET; CNBC, TSN, RDS2). Chicago leads the best-of-7 series 3-2 and can book passage to a second straight Western Conference Final with a victory Tuesday, or Thursday in Game 7 if it becomes necessary. It is a tough position to be in, but one which the Wild are intimately familiar. In the first round, against the Colorado Avalanche, Minnesota dropped the first two games on the road, won the following two home games and then was relegated to the brink of elimination after losing Game 5 on the road. It has been the same path to a do-or-die Game 6 against the Blackhawks. Can the Wild fashion a Game 6 victory at Xcel Energy Center against the defending Stanley Cup champions to force a winner-take-all Game 7 like they did against the Avalanche? The Wild can't think about the enormity of the task which lies ahead and the fact they must beat a team which has won two Stanley Cups since 2010. They shouldn't even cling too tightly to recent history and the fact they wiggled out of a similar predicament against the Avalanche two weeks ago. These Blackhawks are not those Avalanche. They are better, deeper and more experienced. Instead, Minnesota needs to concentrate on winning the first shift and then the shift after that, allowing it to grow into winning one period and the next. If that happens, like it did in Games 3 and 4, Minnesota has the best chance to come out on top. "The beauty of it is, we have a great opportunity tomorrow," Minnesota coach Mike Yeo said. "That's the only thing we should be thinking about. We should be real excited about this opportunity, this challenge, and I believe that our guys are." The Wild are hurting right now. They have played a dozen high-pressure games this postseason. They will be playing their third elimination game in two weeks Tuesday night. They have absorbed a ton of big hits and dished out just as many. Their goalie, Ilya Bryzgalov, has been pressed into action because Darcy Kuemper was injured in Game 7 of the first round. Their best defenseman, Ryan Suter, plays almost 29 minutes a game, but may be playing with an arm injury after a nasty collision with Blackhawks forward Marian Hossa in Game 3 last Tuesday. Others are trying to hide or play through an assortment of bumps and bruises. But that is the currency of being successful this time of year. The Wild have to remember that and push through the pain. "I think it's mental," Suter said. "Every single guy in that locker room, every single guy in their locker room has issues right now. But it's a mental thing, and you have to overcome that if you want to win; that's why it's the hardest trophy to win in the world." There are advantages to playing at home. One of the biggest in the playoffs is having the last line change. It allows the home coach to dictate the matchups, and Yeo and his staff have been masterful at exploiting favorable matchup situations. The Blackhawks can be a matchup nightmare because of how deep they are up front, but Yeo must find a way to deploy Suter and Mikko Koivu against the line centered by Jonathan Toews as often as humanly possible. On the other side of the equation, the Wild need to generate chances against Chicago's third defense pair of Nick Leddy and Sheldon Brookbank, as well as Chicago's fourth line, which has seen limited action for much of the series because of matchup concerns on the part of Joel Quenneville. Minnesota has been at its best in this series when it limits Chicago to a minimal number of shots. In fact, in the 15 periods of this series, the Blackhawks have only reached double-digit shot totals in two periods; the first period of Game 1 and the series-changing second period in Game 5. The Wild's sagging, suffocating defense not only protects Bryzgalov, but is frustrating the heck out of some of Chicago's skill players. Chicago may have won Game 5, but there is no escaping the fact Minnesota has been the better team during long stretches of the past three games and has outscored the Blackhawks 9-4 since the start of Game 3. "We've played well," Suter said. "We've played right with them. That's why it's seven games, and hopefully we get another shot at it." Game 6 is going to be one of the biggest games in the history of the franchise. The atmosphere at Xcel Energy Center will be off the charts, producing an intimidating cauldron of noise that can propel the home team with its energy and intimidate even the most experienced of opponents. It is a special experience which can only be generated in the Stanley Cup Playoffs. It has helped the Wild win all five home games they have played this postseason. It can help them again and allow them to play a Game 7 in a building hostile to them if they feed off what their fans bring Tuesday night. "There's no question that we fed off our fans," Yeo said. "We've asked our players to step their games up as the playoffs have gone on and it seems like our fans have bought right into that too, because every game seems to somehow get a little bit louder, a little bit more emotion in the building. So I'm expecting a lot of the same [Tuesday]. "I'm expecting our group to feed off it again, but at the same time, I think that we've been able to understand that we can't just expect things to go the same way when we're coming home. We went out and we've made it that way. We've pushed the issue. We've forced the issue. We've played aggressive, and that's what we need to make sure we're ready to do [Tuesday]."